Who knew that a simple piece of furniture could change your perspective? The same sofa sectional had been in my living room for as long as I could remember. My parents brought it to the house from their apartment in the Bronx when they purchased the house in the late 1970’s; so that should give you some idea of old it was. It was old school as well… covered in plastic that was cracking and dreadful to sit on in the dead of summer and had a gold paisley pattern on it. I’m not 100% sure why my parents never changed it. My Mom has a tendency of not wanting to let go of things. When she ended up in a nursing home due to a stroke and my Dad was in the hospital for a second time I thoroughly cleaned up their bedroom to make room for the hospital bed he would ultimately need. And boy, were there a lot of things to get rid of. In this living room with said sectional there are also wood paneled walls, also there for as long as I can remember. Probably before my parents bought the house, so it’s not the nice modern ones you see nowadays. I long dreamed of taking down the paneling, painting the walls a bright white (something completely opposite of the dark paneled walls), ripping up the carpets to expose the original hardwood floors and of course getting rid of the sectional. After my Dad passed away I remember sitting on that sectional and wondering what life would be like now alone in the house. Making changes to the living room was the furthest thing from my mind. I think I found comfort in the familiarity. Seeing it the same allowed for memories to easily flood my thoughts. I could easily remember sitting on that couch eating my dinner – the dinner my Dad put aside for me in a tupperware that I only needed to pop in the microwave to heat up after arriving home from work in the city – and talking to him about my day. Little by little though I did make some changes. I moved my Dad’s recliner to the perfect corner so there would be more space in the living room. I moved the rocking chair to what I still refer to as my parents’ bedroom even though my Mom hasn’t been in the house in five years and my Dad passed away three years ago. And eventually I removed two pieces of the sectional. Removed sounds a lot nicer than I threw them out, which is what I really did do. I don’t really recall what prompted me to do it. It was time I guess. Of course I took a picture so that I won’t have to think too hard to remember what it used to look like. The one piece I held on to was the curved middle piece. For two reasons, Lucky, my dog, liked to go under the sofa and I still needed a place for people to sit when they came over. Granted it was a small piece, but, it was something. I had visions in my mind of what I wanted the remodeled living room to look like. I was thinking light aqua walls, whitewashing the accent brick wall, hardwood floors and some patterned curtains. Oh, and I had a vision of a grey couch with studding. I stuck up color swatches on the wall to get ideas for the right shade of aqua and I ordered curtain swatches to match them to my chosen wall color. And then recently something changed. We spend a lot time living our lives with a vision of a future that may or may never come. We think to ourselves, oh, when this happens then I’ll do x y and z. But, what if that thing never happens. What if we never meet the right person, never get our dream job and desired salary, or whatever else it is that we are waiting for? Are we supposed to give up on the dreams we hope would follow? Absolutely not. We should find a way to make anything and everything happen that will make us happy. So, there I was waiting for the perfect salary to have enough money to do everything I wanted all at once. But, I realized that what I wanted was to be able to sit in my living room now and watch television, read a book, crochet/knit, etc. So, I decided I would buy a new sofa, nothing expensive. But, something to hold me over until I could get what I really wanted. I decided on my favorite color, navy blue. I did some research online and then went to the store armed with a tape measure to measure the space between the sofa and the floor. I was hoping to find something that Lucky would still be able to sneak under. He’s 17 and as silly as it sounds I didn’t want him to feel slighted by the new piece of furniture. That I was somehow displacing him from the home he has known since he was few months old. 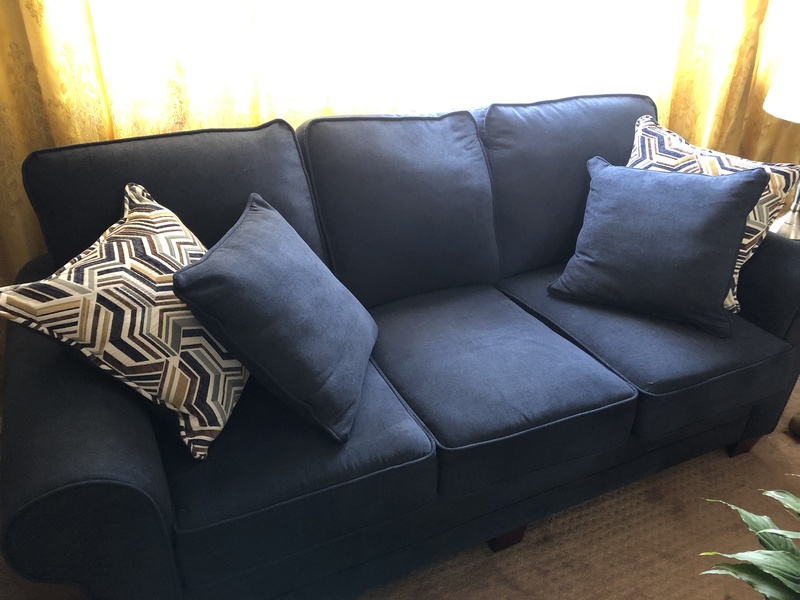 I almost picked a different sofa that would have afforded him the space to go underneath, but, in the end stuck to the one I liked and wanted. That evening I decided that since my new sofa wouldn’t be delivered for another week and a half that I would throw out that final curved piece on the next garbage day to get Lucky used to the idea of not going underneath the new one. Dogs can really take over your life. I also decided that I would breathe new life into my Dad’s old recliner with a new cover. I wasn’t sure if recliner covers existed but a quick internet search let me know otherwise. So, I removed that final piece of the sectional, vacuumed the rug and ordered a grey cover for the recliner in anticipation of my new sofa. And I began to think, maybe I should change my vision and make this new sofa the focal point of it. So, gone were the ideas of aqua walls and in place of it a nice shade of green (although lately I am starting to lean towards a shade of white) which would go nicely with the brick accent wall that I now wouldn’t have to whitewash. I am still holding on to some cool patterned curtains though – I recently ordered a new assortment of fabric swatches to go with this new color scheme. And I am still planning on exposing those hardwood floors that I am sure will have to be stained because of the accident or two (or more) that Lucky has had. And then the day arrived… My new sofa came. It fit into its designated space perfectly and I was in awe of how it changed the whole look of my living room, even with its old curtains and paneled walls. Later that day the recliner cover arrived and I couldn’t wait to put it on and was once again happy at how it completely changed the look of the room as well. The following day I went out and purchased a new lamp. A silver base with a white scale pleat shade to replace the gold base lamp with an almond color shade. I also purchased new picture frames for a few of the pictures that hang on the wall. As I sit in my living room now I am happy with the space I have created. And while I have lived in this home for many years (we’ll just say 30 plus), and have lived in it alone for 3, it’s finally beginning to feel like my own, all thanks to a sofa.